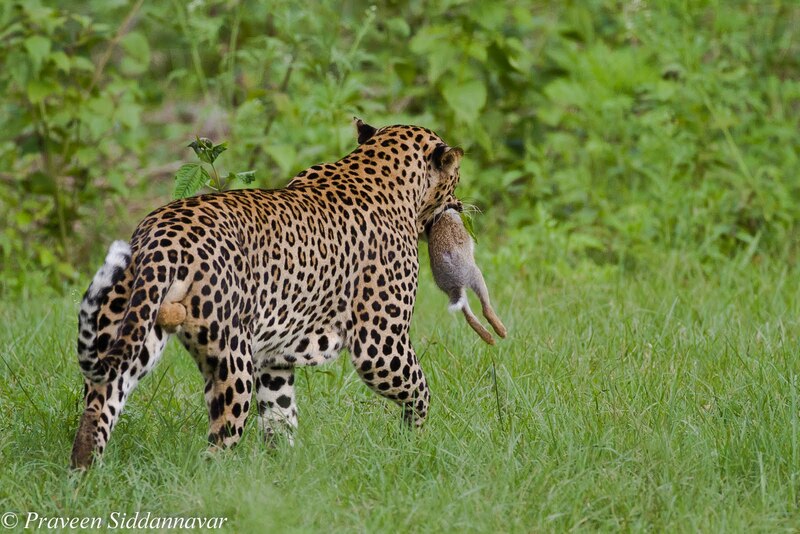 Praveen Siddannavar's Blog: Leopard with a Hare Kill! 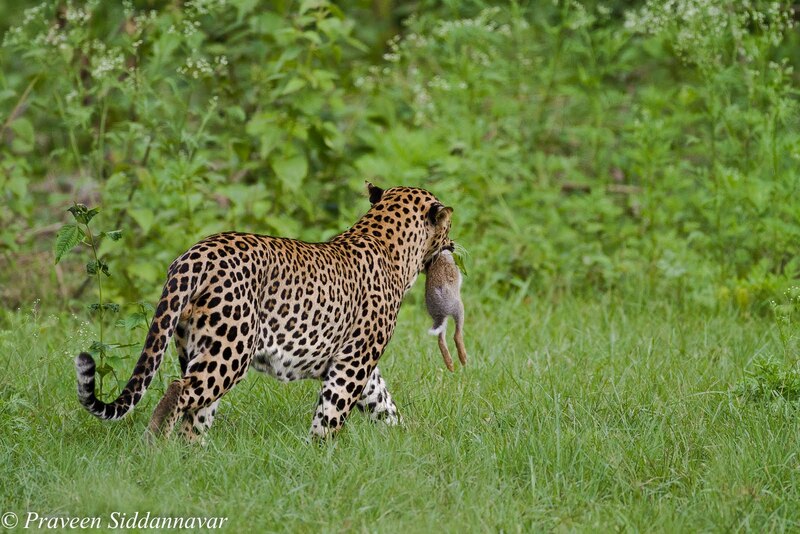 Until last month (June), the leopard sighting at Bandipur was on a high. 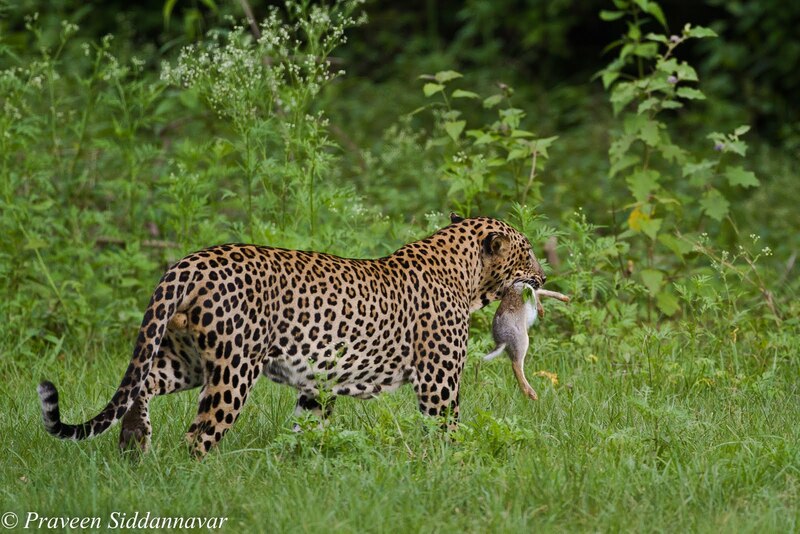 Even my last few visits since April until end of June were excellent with leopard sightings. 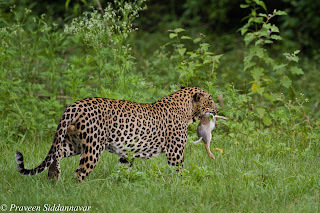 I and few friends were on our evening game drive at Bandipur; we had Basavanna one of the Senior Naturalist who was driving the commander jeep for us. We took the entry from reception and drove towards moor kere, this location has three water holes, hence the name referred to Moor Kere in Kannada. The tigress (Gowri) and her 4 cubs have been spotted here on several occasions. I strongly believe that the cubs were born in this area, hence the family is often spotted here. We patiently waited for a while but no sign of the tigress nor her cubs, despite pug marks all over the place. It is quite obvious that the mother is very protective of her cubs, especially when her offspring's are very young. So chances of seeing them in open is never gonna be easy. (Indian Bisons). 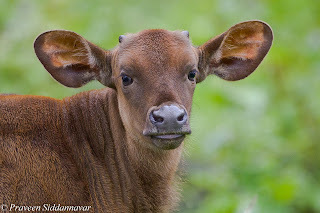 During this time it started to drizzle a bit followed by heavy showers, I was keen in photographing the calf. 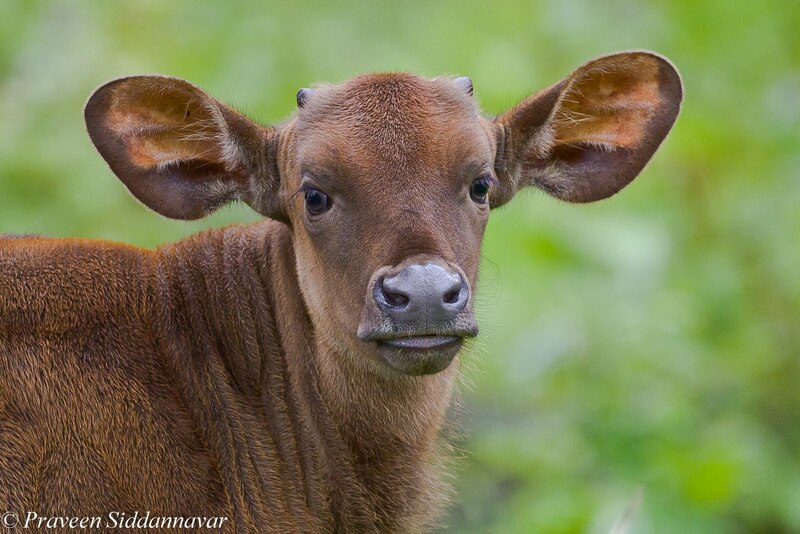 However he was very shy, finally I managed to make a portrait of the calf. The time now was about 5pm, it had been over an hour in the forest and no cat sighting nor any warning calls. In such situation it always good to keep tking rounds near the water holes so we decided to drive towards daiyada katte. As we reached this spot few jeeps were waiting and we were told that they had just spotted a leopard who walked freely on the game track, scented marked his territory and then sneaked into the bushes. The excitement began, upon taking a closer look at the bushes we could spot the leopard, not so clear but he was partly visible. 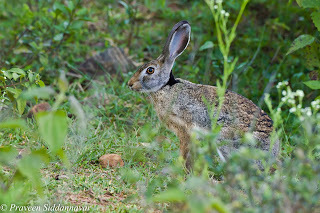 I wasn't sure what he was doing inside the bush, normally at dusk the cats like to free walk in the open or hunt. By now we all could see the leopard in the bush but couldn’t photograph. 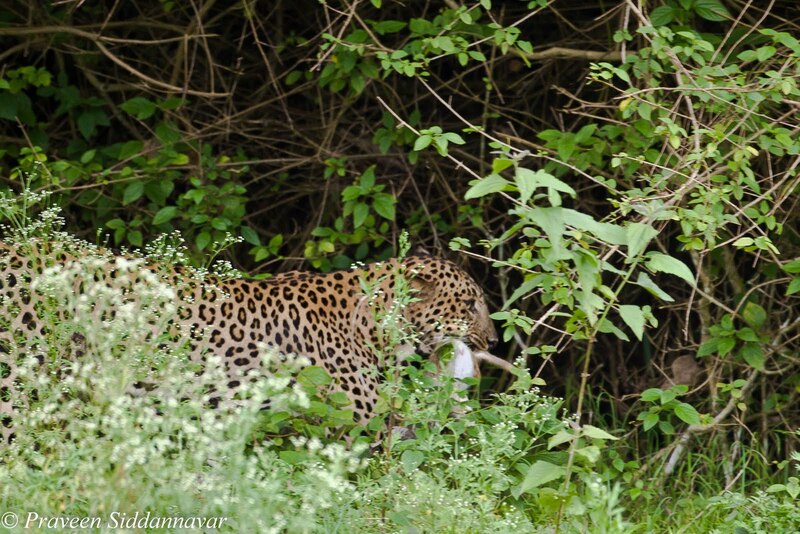 The leopard sensed our presence probably and moved further inside the dense area. 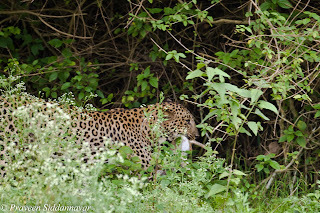 Basavanna mentioned that the leopard may come to daiyada katte water hole so we moved ahead and waited there patiently. A couple of jeeps also joined us and waited but the leopard never made his appearance. After about 10-15 mins the three jeeps that were waiting with us lost their patience and drove away. However we decided to wait, I requested Basavanna to reverse the jeep and position it in such an angle that we should be able to see the game track as well as have view line to the water hole, just in case the leopard comes out towards either side. 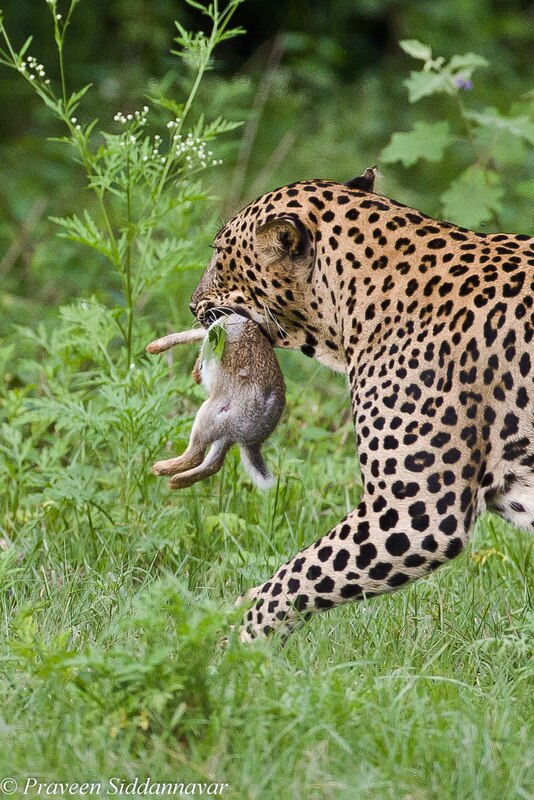 During this time we sensed some movement in the bushes on our left, to our surprise the leopard was stalking, not on a deer, it's hard to believe it was a Blacked Naped Hare (Wild Rabbit) and within seconds he pounced on the hare, this was a easy catch for the big cat. 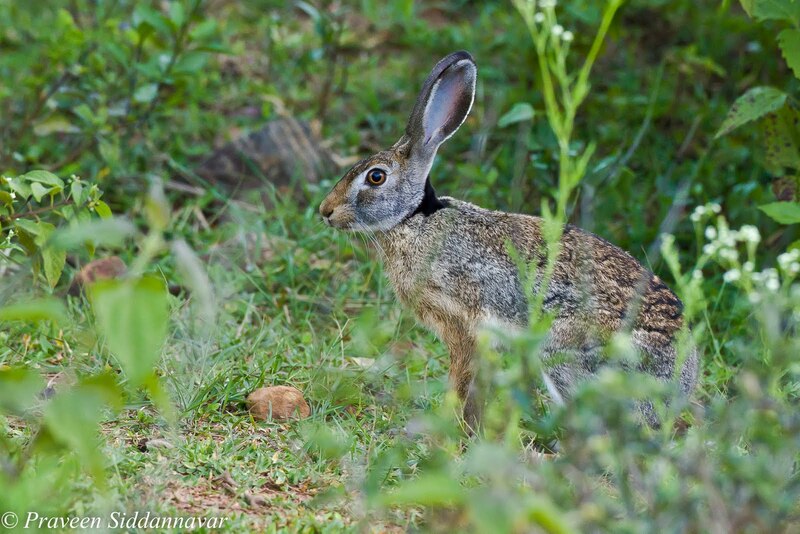 I was amazed, I had seen a leopard with a deer kill and heard about leopard making a hare meal but to see this live was a treat to my eyes. The drama continued, I was sincerely hoping that the leopard may come out of the bush and finally he did. I was ready with my camera, as the leopard walked out of the bushes, he realized that it was a open area and he also had sensed our presence. In fraction of a second he sprinted with the hare in his jaws. 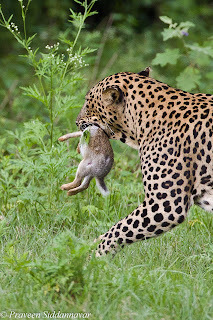 I was quick to fire few shots and managed to make some images well focused on the leopard and the hare. Fortunately my shutter speed was quite good to freeze the action. This was another rare, great natural history moment in the wild that I was blessed to witness. Later the leopard was quick to sneak through the bushes, and this time he decided to disappear in the under growth to have his snack. These cats are so beautiful that I wasn't satisfied despite having seen it on so many occasions. One thing that that could have made my images a stunner was a head turn by the leopard towards me, but these things happen and are not in our control. 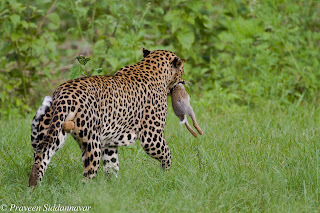 I was told that there were no records and video clips of leopard with hare kill, though leopard often makes this kill. 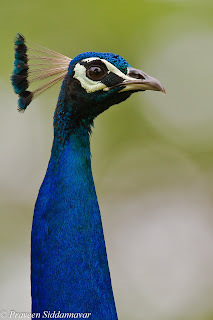 I was fortunate and lucky to get some decent images. The time was running out so we drove towards the exit gate. As we were about to approach the exit gate towards the reception area I spotted a Sloth Bear on our left, but Basavanna drove ahead as he didn’t notice it. We quickly reversed the jeep, the bear was still there but later was quick to disappear in the bushes, and I managed some records shots, not worth sharing though. Finally the evening game drive came to a happy ending and as usual my excitement and these amazing moments kept me awake most of the night. Your narrations are really like a poem and its a valuable information's about nature and wildlife.I am waiting for your new blog postings. Beautiful writeup sir... really u are blessed to witness these rare moments..